Over the last few decades disability studies has emerged not only as a discipline in itself but also as a catalyst for cultural disability studies and Disability Studies in Education. In this book the three areas become united in a new field that recognises education as a discourse between tutors and students who explore representations of disability on the levels of everything from academic disciplines and knowledge to language and theory; from received understandings and social attitudes to narrative and characterisation. Moving from late nineteenth to early twenty-first-century representations, this book combines disability studies with aesthetics, film studies, Holocaust studies, gender studies, happiness studies, popular music studies, humour studies, and media studies. In so doing it encourages discussion around representations of disability in drama, novels, films, autobiography, short stories, music videos, sitcoms, and advertising campaigns. Discussions are underpinned by the tripartite model of disability and so disrupt one-dimensional representations. 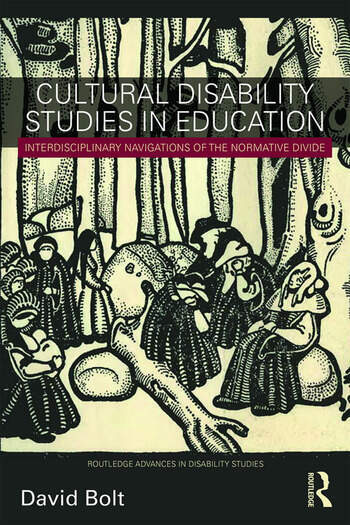 Cultural Disability Studies in Education encourages educators and students to engage with disability as an isolating, hurtful, and joyful experience that merits multiple levels of representation and offers true potential for a non-normative social aesthetic. It will be required reading for all scholars and students of disability studies, cultural disability studies, Disability Studies in Education, sociology, and cultural studies. David Bolt is Professor in the Department of Disability and Education at Liverpool Hope University, UK, where he is also Director of the Centre for Culture and Disability Studies. He is the editor-in-chief of the Journal of Literary and Cultural Disability Studies; a series editor of Literary Disability Studies; and a general editor of A Cultural History of Disability. Previous books include The Madwoman and the Blindman (2012); The Metanarrative of Blindness (2014); Changing Social Attitudes Toward Disability (Routledge, 2014); and Disability, Avoidance, and the Academy (Routledge, 2016).